In an effort to get water cooling tech as close to the heat sources as possible, Georgia Tech researchers made microfluidic passages in the chip die itself and pumped water though, to cool it down, reports PCPer. The results of the test were very positive; the same chip under air cooling ran at 60°C, using the 'on-die water cooling' technique (with 20°C water) the chip ran at a steady 24°C. The researchers used a 28-nanometer Altera FPGA chip in their tests. Microfluidic passages were etched into the silicon and incorporated silicon cylinders of 100 microns in diameter. These channels were just a few hundred microns away from where the chip transistors were operating. A silicon layer was then used to seal over the fluid passages, except for an inlet and outlet. De-ionised water, at 20°C, was pumped into silicon cylinders with an inlet flow rate of 147 millilitres per minute. The chip could operate at "temperatures more than 60 percent below those of similar air-cooled chips". It is thought that applying this technology could eliminate the need for heat sinks or cooling fans on top of integrated circuits. Muhannad Bakir, an associate professor at Georgia Tec, said "We believe we have eliminated one of the major barriers to building high-performance systems that are more compact and energy efficient". Bakir went further to suggest "We believe that reliably integrating microfluidic cooling directly on the silicon will be a disruptive technology for a new generation of electronics". 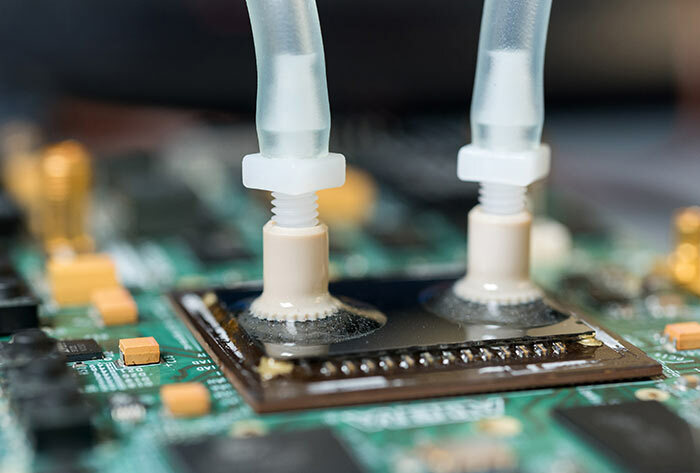 It is thought that, in the future, the new liquid cooling technique could help facilitate stacking multiple chips to allow much denser, higher-performance computing systems. That sounds awesome, now let's wait 7645312 years before it's introduced to PC market. 147 ml per minute is a mere 9 litres an hour. The pump in my water cooled pc is, from memory, 600 l/hr. This is going to make designing water cooled pc systems interesting. Maybe cooling in parallel loops from a central manifold rather than serial loops. Head pressure would seem to be a non issue. The problem remains removing the heat from the water, but this ought to accelerate trend towards radiators with larger slower moving fans, with no need for high pump pressure water will stay in radiators for longer - I suspect that means internal design of radiators may need to be reconsidered. Should also accelerate trend towards much quieter systems. A pump at 60 l/hour will be a lot less noisy than pump at 600 l/hr. Hate to think how long this'd last if/when a cooling pump fails. At least with traditional blocks there's enough heat capacity to absorb enough heat to turn the machine off in time. Surely there is nothing stopping them from mounting a (comparatively) small metal block on top as a heatsink - it'd still be much lower profile than having an active cooler and would help to limit/slow fluctuations, as well as buying it time to shut down or throttle if the temp did rise. Firstly, I suspect it's a complex and potentially expensive process to micro-etch channels directly into the silicon. And we don't know how many chips they ruined in the process! Secondly, we're told that the water input temperature was kept at a constant 20 C - suggesting that either an external cooling source or a non-cycling system was used to maintain the input temperature. Thirdly, we're told what the chip temperature was, but not what he water outlet temperature was or how much heat the chip was meant to be dissipating. Fourthly, we get a comparison to “air cooling” - but is that active or passive? What heatsink - if any - was used? How much air flow? Why no comparison to traditional water cooling techniques? Sure, this is an interesting tech demo, but there are lots of cooling options out there and I don't see anything suggesting this is genuinely a better way to go about it than, for instance, cheap and easily fabricated pressed copper foam (anyone remember me trumpeting Versarien Cu a few years back?). So I don't see this being commercialised.